Our 4-lite sliding patio doors feature a 4-panel design with two panels opening in the middle of two non-opening panels on each side. These sliding doors can easily be installed as a replacement or in new construction with the optional nail fin and are available in multiple sizes as well as custom size orders. Our durable sliding patio doors feature optional energy efficient glass and a wide selection of hardware, colors and grid designs to create the perfect look for your home. White vinyl color standard with optional Almond or Clay available on Series 312 and 332 sliding patio doors. Interior woodgrain laminates are only available on Series 312 and 332 siding patio doors. Exterior painted and laminate color options are only available on Series 312 and 332 sliding patio doors. 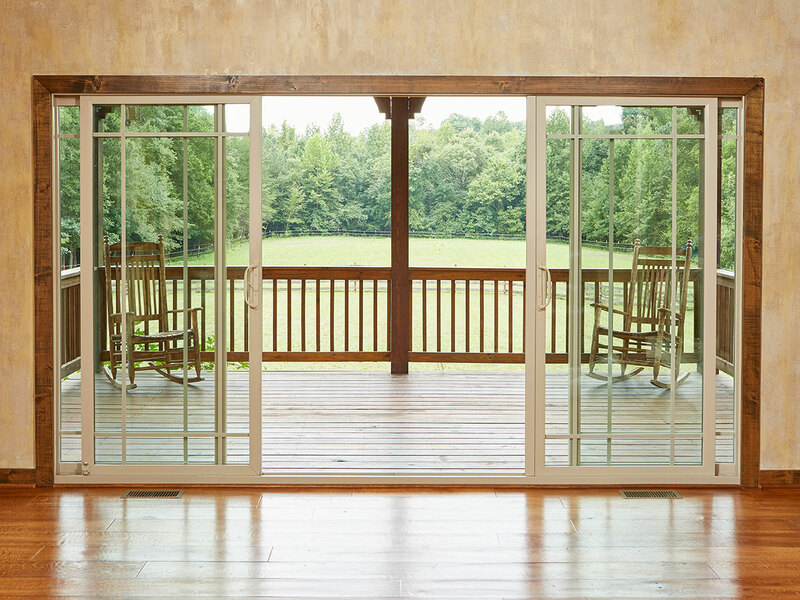 Our most popular sliding patio door model, the 312 is available in widths up to 12′ with a standard height of 6’8″. The 312 offers the most cosmetic upgrades of any door we offer, with three interior wood laminates and Bronze exterior (all laminates on white doors only). The 312 is also available in custom sizes. It’s also available with blinds-between-the-glass and is offered in white, almond and clay. With a built-in 4-9/16″ jamb, DP-50 rating, multi-point lock and heavy duty screen standard, the 332 is in a class by itself. Sizes range in width from 5′ to 12′ and heights to 8′ on some models. With custom sizing available, just about any opening can be filled. The 332 is also available with a host of options, including foot bolt lock, interior wood laminates and blinds-between-the-glass. Available in white, almond and clay colors.